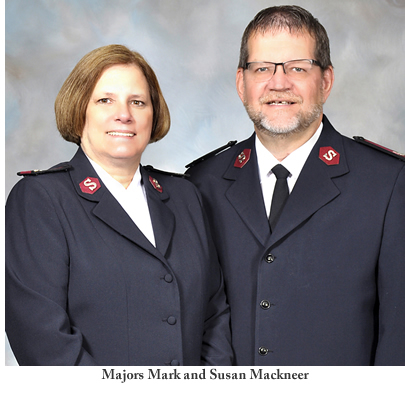 The Salvation Army welcomes Majors Mark and Susan Mackneer as the newly appointed leaders of the Northern New England Division. They are responsible for all aspects of The Salvation Army’s ministry and service in Maine, New Hampshire and Vermont. The Mackneers succeed Majors Raphael and Sandra Jackson who were assigned new positions at The Salvation Army Western Pennsylvania Division as Divisional Leaders. The Mackneers served in The Salvation Army for 37 years, 21 years as Corps Officers and 16 years in various positions at the level of Divisional Headquarters. The Mackneers have worked in the following Divisions; Empire State, Eastern Pennsylvania-Delaware, Western Pennsylvania, Northeast Ohio and Northern New England. In 2016 the Mackneers received The Salvation Army Long Service Order for 35 years of faithful service. In 2014 Major Mark attended the International College of Officers in London, England for six weeks. Also he graduated from Booth University College in Winnipeg Manitoba, Canada with a Bachelor of Arts in Christian studies. In 2005, Major Susan was the on-site Chaplin for victims and rescue crews of Hurricane Katrina in New Orleans. On September 11, 2001, Major Mark was one of the first Salvation Army personnel on site at Ground Zero. Majors Mark and Susan were commissioned as Salvation Army officers in 1981 at the College of Officer Training in New York. They met at The Salvation Army’s summer camp Ladore in Waymart, Pennsylvania before becoming cadets at the college. Majors Mark and Susan are natives of Central Pennsylvania. They have three grown boys, serving in various ministries in Western Pennsylvania and in Ontario Canada. Their family now includes 8 grandchildren. In 1993, Majors Mark and Susan were the Divisional Youth Secretaries for this division. The Majors are happy to be returning to Northern New England and serve those in need alongside a committed team of Salvation Army officers, staff, volunteers and supporters.